"Shop in your High Street" says the Town Council, the Melksham Independent Traders, the Chamber of Commerce, the Federation of Small Businesses, the Melksham Independent News, and many more. "Shop Online" say Wiltshire Council (via Wiltshire Online), and many more including some of those very same businesses that are members of the FSB, the Chamber of Commerce, and even the Melksham Independent Traders. Are the two statements pulling people in different directions? To some extent they are, but both are pulling people away from driving to some town across the county to do their shopping, with all the time and energy that may take. At the same time, we could be considered a little hypocritical by encouraging people to come here to our town rather than shop in their local high street. Of course, the two soundbites I started with are simplistic. Much can be bought locally, but for more specialised products (not available in every High Street, but sprinkled across the country) there's much merit in online. Some of our Melksham Independent Traders fall into that specialist category - did you know you can buy handpainted glasses and Comics in Melksham, whereas you'll be hard pushed to find them on the High Street of Devizes, Chippenham, Trowbridge or Corsham. And, yes, there are things you'll find in Trowbrigde that are missing from Melksham. 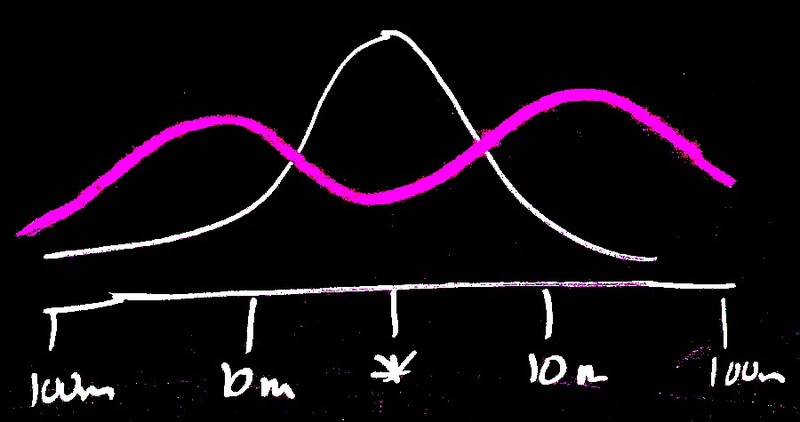 The typical business's customer base is shaped like a pile of sand - the white line on my graph. A shop at "*" attracts local shoppers, and as people get further away, the number of them that come to the shop reduces. For example, we have excellent Indian restaurants in the town. Customers from Melksham account for the majority. Some will come from Calne, Bradford-on-Avon, Westbury. But the customer from Solihull, Axminster, Chichester or Hereford will be rare unless he's in town for some other reason. So - what's that mauve line? Well House Consultants runs two linked businesses and at first they appear to have nothing in common. Firstly, we provide niche training courses in computer programming - see [here]. And secondly we provide hotel rooms for visitors to the Melksham area - see [here]. But it turns out they do have a great deal in common - the shape of the customer profile, which is dramatically different to the norm. There aren't very many local delegates on our courses. That's because we're so specialised that people come to us from far and wide. And anyone who's local and looking for IT training is likely to be looking for a far more general course than we can offer. You'll note that I'm not saying "never". We have trained people who live within walking distance, and we have trained people who work in Bowerhill. And my very earliest memories of Melksham are of visiting Avon Tyres (as it then was) to talk about specialist computer graphic systems for the design of Tyre treads with their R&D department. And there aren't many local guests at our hotel. That's because they have their own homes in Melksham, so why would they want to stay with us? Yes, there are exceptions - people buying into the area or moving out. People who are having major works done on their homes, etc. So - we try and place our business locally when we need something that's easy to get close by. And we order online where it's a bit more specialised. But the flip side of the coin - in our case - is a business which brings people into Melksham. We're not actually competing with other centres - they don't offer courses like ours. And we're not actually competing with online suppliers, as certain courses (and programming course are notable amongst them) are not as effective online. Is this how to run a business for businesses?